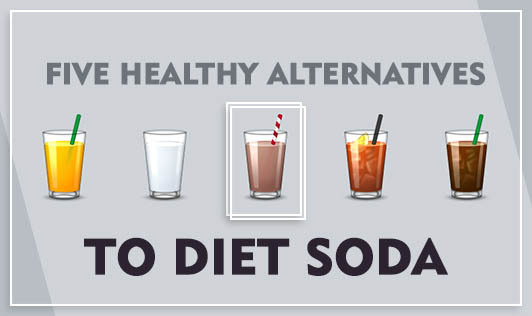 Diet soda gets you addicted to it for all the wrong reasons. It lures you in with the promise of being sugar-free, masking itself as a ‘healthy’ alternative to the normal soda. Sure it saves you the unnecessary calorie consumption but is it really a good choice over natural, healthier beverages? Water: Simple plain water is the healthiest drink you can have. If plain water is too boring for you, you can make it interesting by adding fresh herbs, citrus peels, sliced ginger, or cucumber, making it your very own sparkling water. Milk: Skimmed or low-fat milk makes a very good, healthy substitute for diet coke and other sugar-free soft drinks. Regular soda drinkers often miss out on milk, which can lead to nutrient (calcium, magnesium, vitamin A and D) deficiencies. Skimmed milk will provide all the vital nutrients minus the extra calories. Fresh Fruit Smoothies: Instead of the sodas and store-bought high-cal smoothies, opt for home made fresh fruit smoothies. Combine a serving of fruit with some ice, water, or milk and just blend. Garnish with some mint leaves and relish away! Low-Sodium Broths: Low sodium broths or clear soups can satisfy your thirst, provide you with fluids and nutrients, without the sugar. Avoid making ready to drink soup and adding too many sauces, salt, or ajinomotto to keep the sodium level less than 200mg per serving. Tea: Avoid sweetened ice teas bought outside. You can make your very own iced or herbal or flavored tea with vanilla, cinnamon, cardamom, or other spices along with just a teaspoon of sugar or honey for sweetness. You can also include black tea or green tea for added goodness of antioxidants, flavonoids, or polyphenols!